Zonda Tec Ghana is professional Supplier of heavy duty vehicles. In the meantime, we offer excellent after-sale service, which includes abundant spare parts. •We are professional Supplier of Heavy Duty Truck Parts. 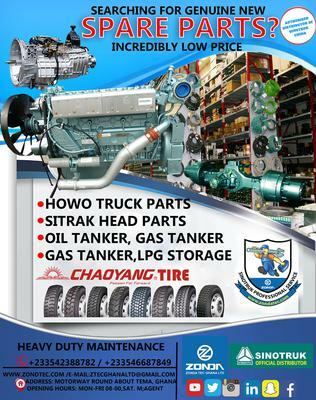 And we specialize in original spare parts for SINOTRUK HOWO, STYER, Golden prince and SHAANXI spare parts of Shacman, D long trucks, O long trucks,Gas-Water-Petrol-Oil Tankers of all size. •	1. Truck parts for cab. •	2. Truck parts for engine. •	3. Truck parts for axle. Am interested in yours truck.